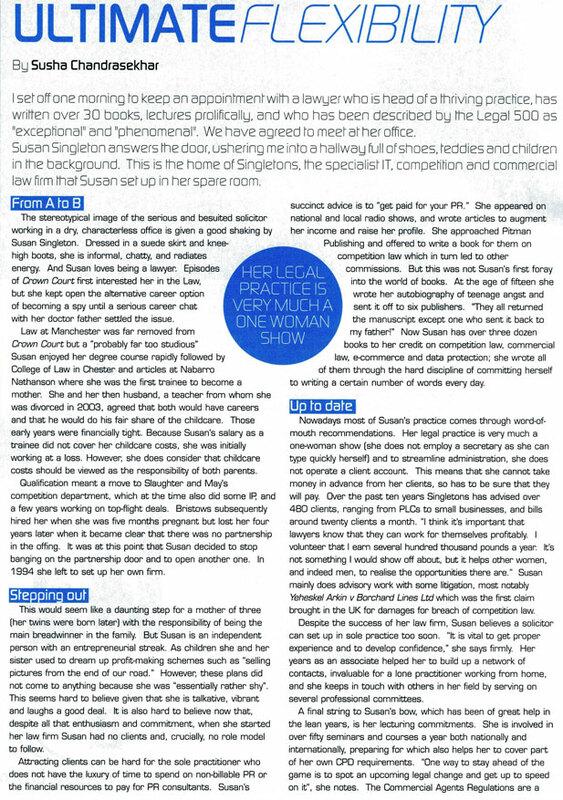 Susan Singleton is a solicitor and practises through her own firm of solicitors in the commercial, competition and intellectual property law area. 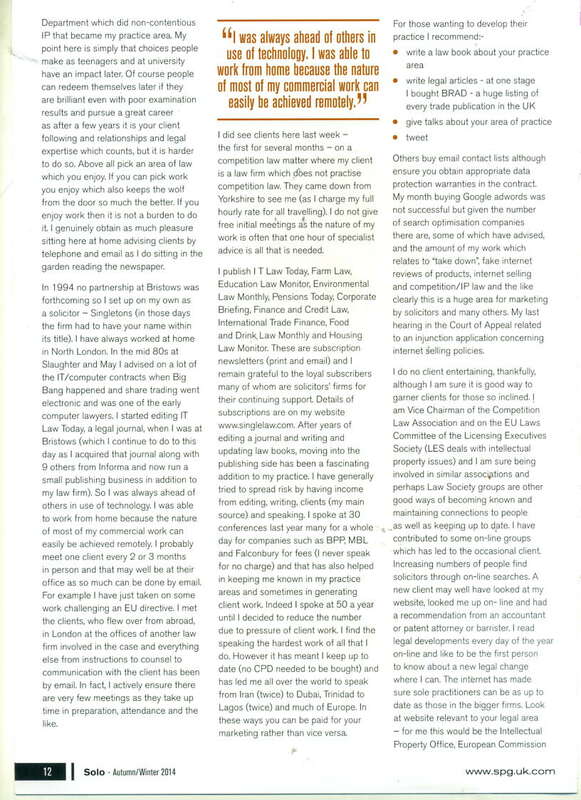 After training at London solicitors Nabarro Nathanson (now CMS Cameron McKenna Nabarro Olswang LLP, trading as CMS), she moved to the EC/Competition Department of City law firm Slaughter and May, solicitors and thereafter the London intellectual property law specilalist solicitors' firm Bristows, until founding Singletons, Solicitors. She has advised many major public companies in the UK and abroad. She has served on the Contracts Group (formerly known as the Legal Committee) of the Chartered Institute of Purchasing and Supply and was responsible for updating of the CIPS IT Model Forms of Contract. 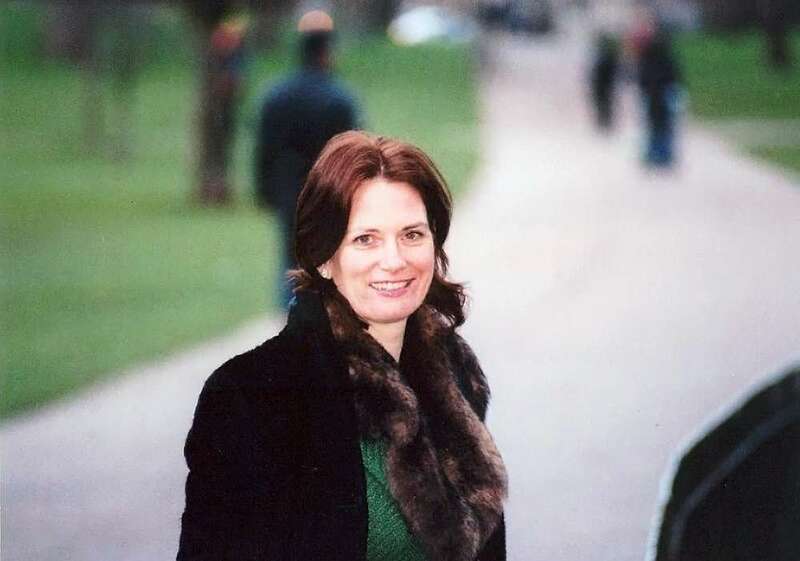 Vice Chairman of the Competition Law Association until 2016, Susan Singleton is author of over 30 law books and is a frequent writer in her field. Recent books have included Commercial Agency Agreements (Bloomsbury 4th ed 2015), Buying and Selling Private Companies and Businesses (10th edition, Jan. 2018, Beswick and Wine, Bloomsbury Publishing), Joint Ventures and Shareholders' Agreements, 5th edition 2017, Bloomsbury Publishing, and on competition, data protection, and internet law. She follows EC and UK general commercial law developments closely. She speaks frequently at UK and international conferences in this area and has spoken at about 1700 legal conferences. She is the editor of the three volume Graham & Trotman looseleaf Comparative Law of Monopolies. See Susan Singleton's "Author Page" on Amazon and her author video. On the intellectual property side she edits/publishes/owns the subscription newsletter IT Law Today, the UK's oldest IT law journal (published since June 2010 by Singlelaw) and also publishes Corporate Briefing and Finance and Credit Law and International Trade Finance newsletters available on subscription. More generally in January 2014 she additionally acquired 6 more legal journals from Informa plc making the Singlelaw publications a stable of ten legal journals (see links on the home page of this site). She is a contributing author to Company Secretary's Factbook, Accountants' Legal Service, Employment Personnel and Procedures and other publications. She updates her textbook Business, the Internet and the Law (Bloomsbury) three times a year and is a contributing author and updater of Bloomsbury's EContracts looseleaf. She regularly updates parts of the Oxford Dictionary of Law - the 4th edition (1997) and 5th, 6th, 7th. 8th and 9th (2018) editions). She is on the Committee and was former Chair of the Licensing Executives Society (EC Laws Committee) and until 2010 sat on the Board as an Independent Member of the Direct Marketing Authority. 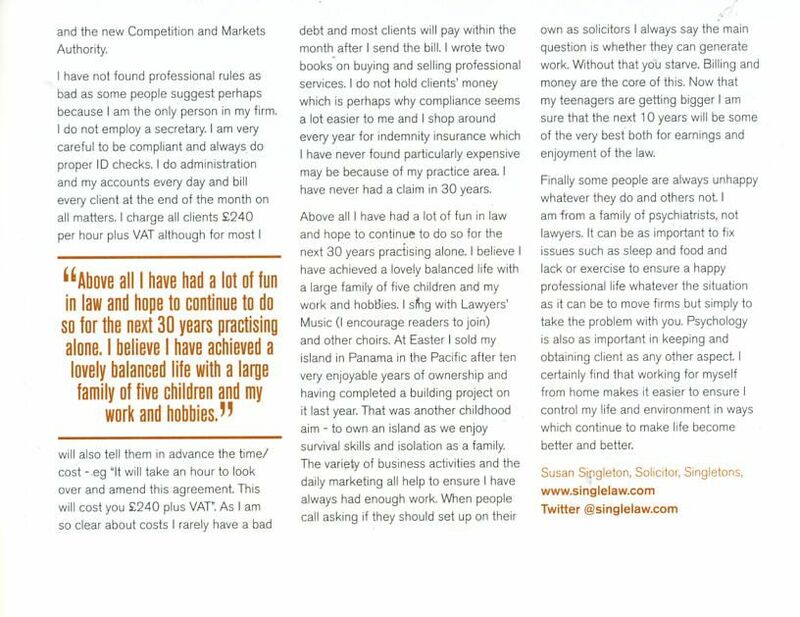 Leading IT lawyer Susan Singleton tells Chris Dignan of law.com how she risked leaving a big firm to go-it-alone - while bringing up five children. 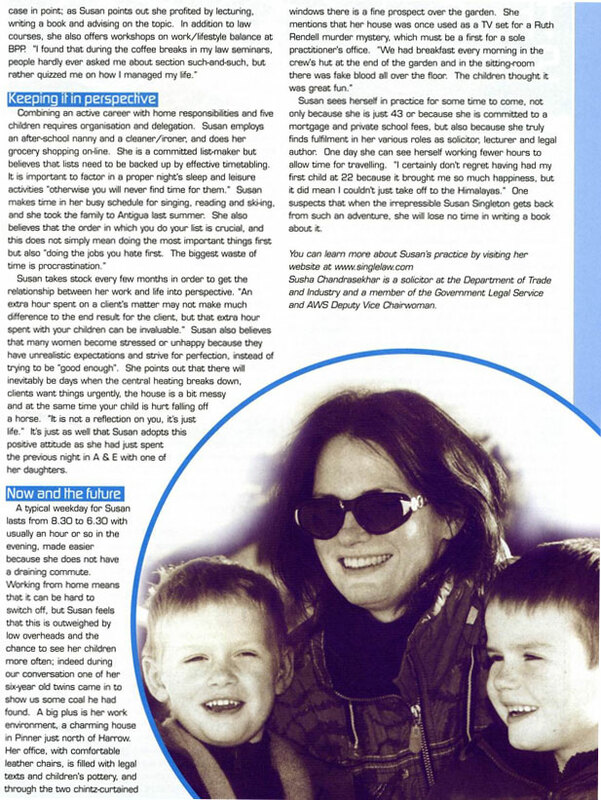 Susan Singleton went back to work just two weeks after giving birth to her first child because she believed maternity leave was 'sexist'. She was 22 and was doing her articles at Nabarro Nathanson. 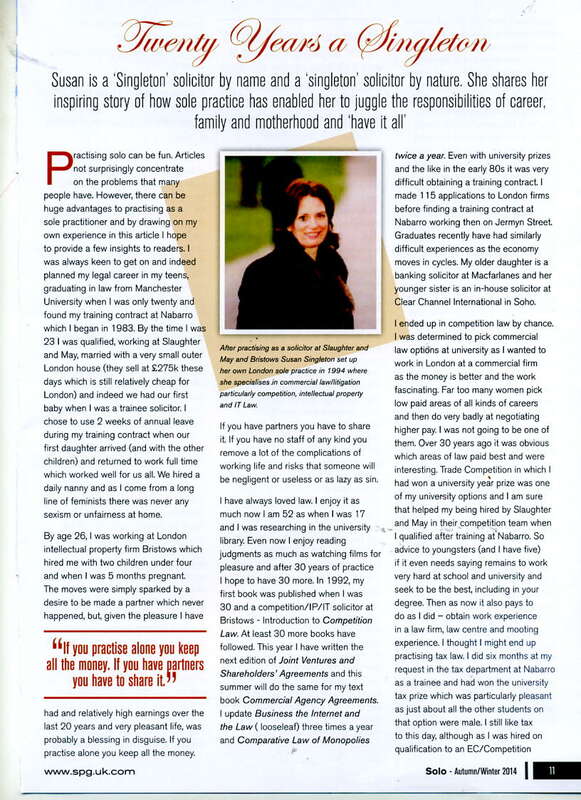 Today, she has five children, is 38, and has left the comfort and support as a firm's employee to become a successful leading lawyer in her field, working solo from home. Singleton is unconventional, undaunted and hugely energetic which becomes infectious to most people she meets. She gives the impression that nothing is too difficult, with an enthusiastic smile rather than an arrogant declaration. It was not long before she was in demand for her specialist knowledge in copyright and IT law. She is also thankful that the IT volcano had erupted by this time so her timing could not have been better. Today, she is ranked by Chambers & Partners as a leading IT/ computer lawyer, is editor of IT Law Today; Trading Law and Trading Law Reports; Comparative Law of Monopolies; and Purchasing and Supply Briefing; as well as writing for a host of other publications and being a guest on Radio 4 programmes. Last year, Singleton had two twin boys, to add to her other children aged 15, 13 and 11. Full-time motherhood without working has never appealed. She employs a nanny and cleaner and enjoys the best of both worlds. 'I think it is much harder work staying at home with children all day. I would much rather write an interesting article on internet law than scrape remains off a saucepan. I like being with my children but don't want to be with them all the time.' Her dedication to work, impressive CV, client list and general success could create impression that she is a hard person. Far from it. She rarely stops smiling, is interested in gossip and is highly affable and charming. She met her music teacher husband, Martin, when he was a choirmaster and she sang at Chester Cathedral during law school. Singing and writing are two of her other passions. She dreamt of being a novelist if she hadn't been a lawyer and has written one or two books (as yet unpublished). The nearest she came to that a few days ago was when her home was used for the filming of a Ruth Rendell story. "